PatsFans.com is proud to welcome former New England Patriots quarterback Steve Grogan back for another season. Grogan played in 149 games with the Patriots from 1975-1990, and was named to the Patriots Hall of Fame in 1995. Steve will join us each week to provide his insights on the progress of the Patriots during the 2001 football season, and will be on hand for the Pats 2002 playoff run as well! R.R. Marshall: Steve, after a sluggish first half the Patriots put up 28 second half points to crush the Carolina Panthers 38-6 and complete their worst-to-first 2001 campaign by clinching the AFC Eastern Division Title. You were concerned about this team coming off a bye week, and for the first 30 minutes it would appear your fears had been justified? Steve Grogan: I thought the Patriots came out and played well in the first quarter, but they didn’t put the Panthers away. They had a chance to really blow the game open in that first quarter. They broke on top 10-0 after Ty Law returned that first Scott Weinke interception for a touchdown, and then it looked like they had scored again when Otis Smith ran back another interception for a score. At that point I was thinking that this was going to be a rout, but after his runback was wiped out by a penalty they just seemed to go flat. I don’t know why that happened, and I don’t think they know either. But the game shouldn’t have been as close as 10-3 at halftime like it was. The Patriots were clearly the better football team but they just couldn’t put them away until they put up a couple of touchdowns in the third quarter. In that second half we saw the team we had been accustomed to watching the second half of this season. They just annihilated Carolina and won going away. RRM: I’ll just ask you straight out, was it the off-week that was responsible for their slow start? SG: I think having the bye the week may have had something to do with their play in the first half. A bye week is good because you get some rest but it also takes away that edge that you had going all season. I was worried about this game because of that, but fortunately Carolina was a bad enough team where the Patriots had the luxury of regrouping over halftime and then coming back out in the second half and beating them up pretty good. RRM: You were actually in attendance at Ericsson Stadium as a guest of the Panthers. That begs the question, is it true that “Nothing could be finer than to be in Carolina in the morning”? SG: Not in a cold rain, I’ll tell you that! I was in a tent outside the stadium prior to the game and after about a half-hour of standing on the wet, soggy ground the water was seeping through my shoes and my feet were frozen. I was glad to get up to the luxury box for the start of the game, but to be honest you and the people watching on TV at home probably had a better view of the game then I did. RRM: It looked like you could have sat anywhere you wanted to in that stadium. They reported the actual attendance at around 21,000 but I’d be surprised if it was even half of that! SG: If there were that many people there then half of them were Patriots fans. It actually felt like a home game for the Patriots to be honest. There was snow on the sidelines and a cold rain falling and it even felt like New England weather, so it made for a nice experience. I talked to a group of about 30 people who came down from New England for the game while we were waiting for the return flight at the airport, and they were the group that had been sitting in back of the Patriots’ bench. I asked them how they got such good seats for the game and they told me they didn’t, they just got general admission seats and then asked the security guard if they could move down, and he let them go! They ended up with the best seats after paying the cheapest price, and they all had a great time to boot! RRM: Speaking of boots, Jets’ kicker John Hall nailed a 53-yard field goal to beat the Raiders and give New England the division title. I guess we should get those thank you cards in the mail this week? SG: The bar at the airport in Charlotte went berserk when Hall hit that kick. You would have thought you were in a bar in downtown Boston there were so many Patriots fans there. I saw the replay and former Patriot Tom Tupa made a nice dig on a low snap on that play, so he did his old team a big favor. 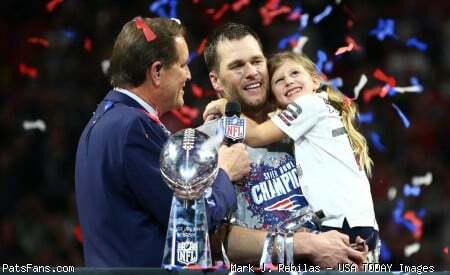 RRM: While you were away some of the local papers and our website ran a poll for the Patriots MVP this season. Troy Brown drew the most votes, and his 68-yard punt return for a touchdown in the third quarter pushed New England’s lead up to 17-3 and they never looked back after that. He may not have been voted to the Pro Bowl, but at least local fans seem to know his true value? SG: Troy Brown’s return was the key play of the game for the Patriots. That touchdown gave them the cushion where they could relax and go out and play and just have fun. Right after that score a lot of good things started to happen for the Patriots. Antowain Smith broke a long 32-yard run for a score that essentially iced the game before the end of the third quarter. I don’t think anyone could argue with the selection of Troy Brown as the Patriots MVP. Tom Brady and Antowain Smith have both had good years, but when you had to turn to one guy to make plays for the team it always seemed to be Troy Brown who came up with them. It was a shame he didn’t make the Pro Bowl as a starter, and I hope he gets to go because he deserves the recognition after the kind of season he’s had. RRM: The Panthers may be at the bottom of nearly every category in the NFL, but one area where they do excel is at kick returns with their excellent return man Steve Smith. He was held in check by the often ineffectual New England coverage units, so is that a sign that they have finally shored up that area as they head into the postseason? SG: They seemed to be really focusing on kick return coverage in this game, and I’m pretty sure that is an area they really worked on during the bye week. They took on Steve Smith, who is one of the top kickoff and punt return men in the NFL, and on six kickoff returns they held him to an average of only 16 yards per return. That’s really good coverage by your special teams. That’s a really good sign because in the playoffs you just can’t give up long returns and expect to be around too long. RRM: The only troublesome item worth noting about the performance of the Patriots defense was that they allowed someone named Richard Huntley to run through them for the tune of 168 yards on only 22 carries. I was wondering if Barry Sanders had come out of retirement the way he was gaining yardage in such big chunks? SG: Huntley was over 100 yards before his tenth carry in this game, and I was surprised that he had as many yards as he did when I saw his numbers flashed on the scoreboard. Something like that has to be a bit of a concern to the defense, especially at this point in the season. His gains were coming on big chunks like you mentioned, 15 yards here and 18 yards there, which was something we hadn’t seen a back do to the Patriots defense over the second half of the season. Tedy Bruschi left the game with a mild concussion, and he has played so well for them in the middle that I’m sure his absence didn’t help with the run defense. Bryan Cox and Ted Johnson have only played sporadically, and they might have found it difficult getting their feet wet and getting their timing down. Maybe in the long run that will turn out to be a positive thing for the defense, that both these players got some playing time in. The Patriots gave up a lot of yardage on the ground earlier in the season but since then have been very stingy against the run since then, so we’re all hoping that we saw against the Panthers was an aberration. But if they end up playing Pittsburgh for the AFC Championship against Jerome Bettis they’d better not forget how to stop the run! RRM: Speaking of the Steelers, the fans are already looking forward to a Patriots-Steelers match up in three weeks for the AFC title. What are the chances of that happening? SG: I think they are the two best teams in the conference right now. The chance of them meeting up in the AFC Championship Game appear to be pretty good. Pittsburgh is a good football team. They have a great defense and a good offense, but the Patriots have had success in the past shutting down Jerome Bettis and he’s basically the Steelers’ offense. Kordell Stewart has had a pretty good year, but with a guy like Bill Belichick designing a scheme to confuse him he could self-destruct in a hurry. But the Patriots still have to get by their first round opponent, and the good news is they’ll be playing that game in Foxboro so the home fans will get at least one more game there. It will be freezing cold and that should be to their advantage no matter what team they wind up playing. RRM: In your opinion who would be the ideal opponent for the Patriots in the first round of the playoffs? SG: Seattle is probably the weakest potential playoff team in the field but by the time people are reading this Baltimore may well have eliminated them. I believe that playing both Miami and the Jets twice this season has its advantages, and either one of them would be a good match up for New England. Preparation would be a lot easier because you know what they do and they know what you do. There’s a lot of familiarity there, and if you have to play either the Raiders or Baltimore you don’t know as much about them and that can be a problem sometimes. RRM: Before we put this remarkable regular season behind us, how do you even begin to explain what this team has achieved and how they have managed to win 11 games and a division title this season? play well together as a team. They do what the coaches ask them to do and it’s amazing to me that Belichick has been able to do what’s he’s done with what he has on the field right now. RRM: The Patriots now have another week off before hosting a divisional playoff game. Are you at all worried that another bye week this close to the last one will do more harm then good? SG: This can be a scary scenario, having a second week off in three weeks, but the playoffs are a different thing entirely. You know that if you lose you are out, and that’s a lot different compared to playing the worst team in football after a week off. I think the fact that they had this first bye week and came out flat will help them to realize that they can’t allow that to happen again. This game against Carolina may very well prove to be a blessing in disguise, and they will come out with a lot more intensity right from the beginning in their first playoff game. I really think you have an edge knowing that you only have to win two games to get to the Super Bowl, and that is a lot better feeling than having to win three in a row. Having the bye week also ensures that the Patriots will be healthy for whoever they play in their first playoff game. They just have to understand that they need to come out with much more intensity for that game, and I don’t think that will be a problem. RRM: What are Grogan’s grades for the division-clinching win over the Panthers? SG: The defense played very well and deserves an A. They kept Carolina out of the endzone the entire game, including in that first half when a Panther touchdown could have made it a different kind of game. Lawyer Milloy gets a gameball for his seven tackles and solid play the entire day. It wasn’t a great game by the offense but they got done what they had to, so they get a B. Tom Brady wasn’t spectacular but once again he did what they asked him to do. Troy Brown gets a gameball for his punt return and his six catches that enabled him to break the club record for most receptions in a season with 101. I think the offensive line gets one as a group for the protection they gave Brady and the nice blocking they did on several of the screen passes that set up some of their scores. Now all of the players can take some time off and watch the wildcard playoff games in their living rooms (and they’ll be glued to their sets, believe me!) this weekend. We’ll talk to you again in two weeks! This entry was posted in Uncategorized on January 7, 2002 by Steve Grogan & R.R. Marshall.